“[—MI provide a new lens to perceive students and a new tool for acting on that information. Using such lens enables teachers to focus on the strengths, instead of the weaknesses of the students. n Consequently, this gives students a can-do attitude since they are using their strengths. n Once we focus on the strengths, teachers and students will have “Higher Expectations”. n They help teachers create more personalized and diverse lessons to accommodate their students’ learning needs, which leads to more opportunities for students to learn the expected material. n They allow teachers to “provide concrete opportunities” to develop their students’ “intellectual potential”. Why is it necessary for teaching? What are the areas of DI? 1. Content – what the student needs to learn or how the student will get access to the information. 3. Products - – culminating projects that ask the student to rehearse, apply and extend what he or she has learned in a unit. Finally, before introducing some practical interactive ideas, they summarized the relation between MI and DI. Then came Erika Van Winden with a number of ideas for Warm-Ups to academic Writing classes and how to help students to look for info online to promote different ideas for writing. The most important thing is to convince them to use Keywords from the topics suggested to succeed in finding the info they are looking for. If they use the long sentences given by their teacher to introduce the topic idea, they would get lost in the maze of info online and get nowhere. This could be done by asking them to look for certain simple photos online using just Keywords not full sentences. The teachers did this practically during the session twice and were excited to be able to detect the photo introduced. Another idea is to ask the students to write different words and put them in a jar. Mix the words, then ask each student or group of students to pick 4 or 5 words and make a story or an article out of them. You can also use usual photos or abstract ones and ask them to write about their impressions of these photos. You can add points or bonuses for doing such activities to enthuse your students. You can also adapt these ideas to different levels and ages. 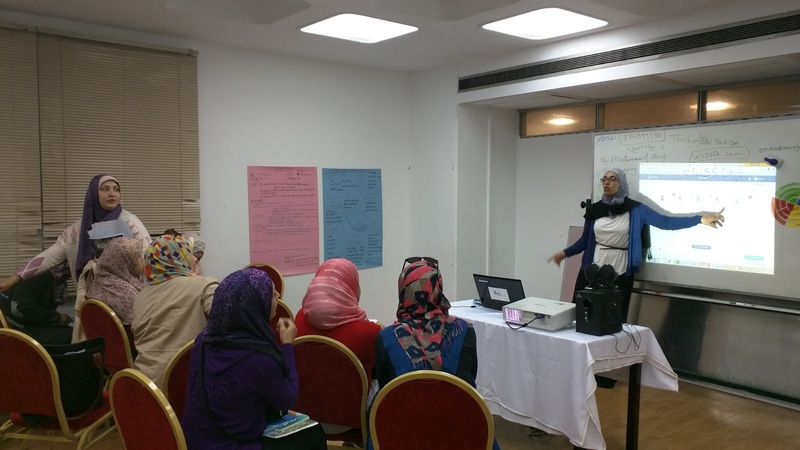 Thirdly, Maha Hassan came to speak about the relationship between Bloom’s Taxonomy and the Four Skills of teaching the language. Integration between both is essential as they complement each other. She also pointed to the relation between them and Multiple Intelligences and Differentiate Instructions that Mizy and Doaa spoke about in the first sessions. More info will be provided about this idea so soon!! Stay Tuned! !